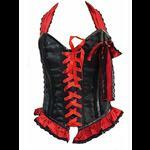 A red satin corset with a front busk fastening and flat steel bones on either side. 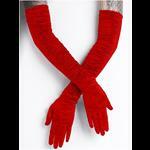 There are 14 further bones throughout which are covered on the outside with black satin. The lower section of the corset has two wide satin panels giving the illusion of a somewhat reduced waistline. The back has adjustable metal eyelet and black satin ribbon lacing and the top and bottom of the corset are edged with black satin ruffled ribbon. 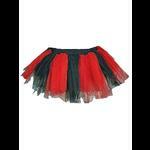 The corset comes with a soft net tutu finished with red eyelet ribbon lacing. Tutu - all sizes: Waist: 24" to 36" Length: 13"
Bust: 30" Waist: 24" Length at side: 17"
Bust: 32" Waist: 26" Length at side: 17"
Bust: 34" Waist: 28" Length at side: 17"
Bust: 36" Waist: 30" Length at side: 17"